Welcome to an irreverent memoir of a passionate photographer/writer fighting cancer on his own terms, while living a love story. James Hockings is a witty and sometimes profound companion for anyone facing a life-threatening disease. He has written a soulful answer to Hitchens’ Mortality. Zen Slaps is available in paperback by order from Chapters/Indigo, Barnes & Noble, and a wide range of bookstores; in print or eBook through Amazon.com, Amazon.ca; or available as an eBook from a range of online eBook retailers like Kobo. Search by ISBN (above). For Jim Hockings at 64, life was very good indeed. The respected photographer had launched a writing career with the 1960’s novel The Redemption of Danny Harper, with more books to follow. In excellent health, the amateur distance runner had overcome prostate cancer ten years earlier, largely through his own research. Best of all, he had met the love of his life and looked forward to a wonderful future with her by his side. Then cancer attacked again, on a new front. Here is his spirited counter attack in real time: provocative essays, selected personal correspondence and cancer forum postings, arranged in chronological order, with occasional reactions from his wife, doctor and friends. Be warned: this is a man who commissioned a statue of Robert Crumb’s underground cartoon character Mr. Natural for his gravestone. 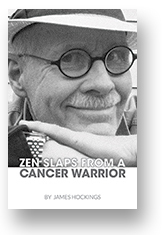 If you are living in ‘cancer world’, know that Jim Hockings is on your side.